003 - St Helen's + St Peters Church, site of a Cherry-Garrard memorial. 087 - St Andrew the Great Church, site of Captain Cook memorial. 110 - St Paul's Cathedral, site of Scott Polar Party memorial. 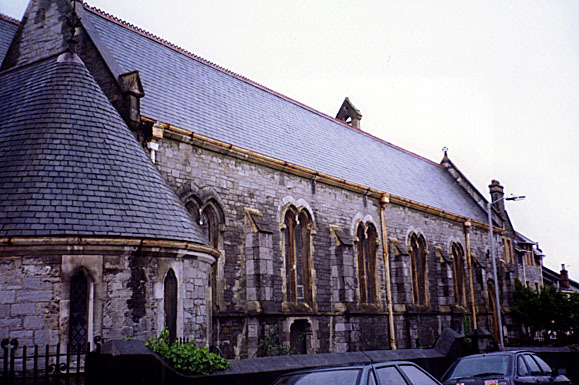 112 - St Anne's Church, site of L.E.G. Oates memorial. 113 - Parish Church of Holy Trinity (Meanwood Church), site of L.E.G. Oates memorial. 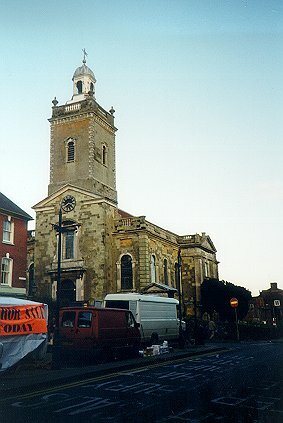 114 - St Peter-at-Leeds, site of L.E.G. 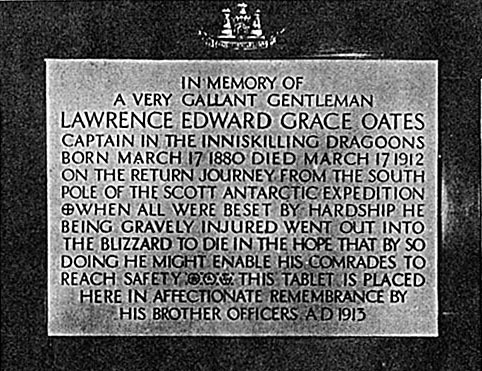 Oates memorial. 120 - St Mary the Virgin, site of L.E.G. Oates memorial. 121 - St John the Baptist, site of Frank Wild memorial. 126 - St Mary's Church, site of the Sir Reginald Skelton memorial window. 131 - St Mark's Church, site of the Robert Scott oak statue. 132 - Emmanuel Parish Church, site of the Robert Scott memorial window. 133 - St Peter's Church, site of Scott Party memorial windows. 137 - St Mary's Church, site of Eric Platt memorial window. 151 - St James the Great Church, site of a memorial window and the grave of Sir James Clark Ross. 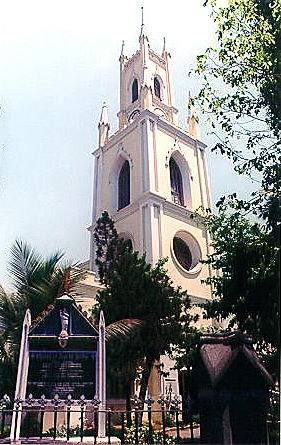 170 - St Thomas Cathedral, site of 'Birdie' Bowers memorial. 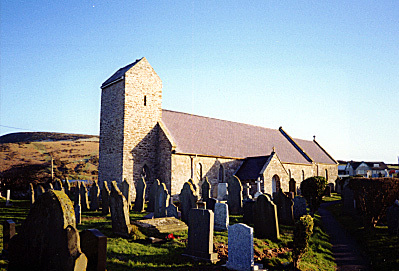 171 - St Ninian's Church, site of 'Birdie' Bowers memorial. 209 - Church of St Mary the Virgin, site of memorial to Petty Officer Edgar Evans. 223 - The Collegiate & Parish Church of Swansea St Mary, site of an oak chair in memory of Petty Officer Edgar Evans. 238 - St Cuthbert's Church, site of baptism of Captain James Cook. 262 - St David's Cathedral, site of service to welcome Amundsen. 272 - St Margaret's Church, site of marriage of Captain James Cook. 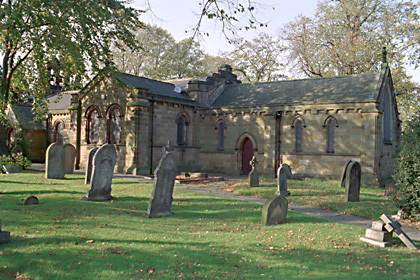 279 - Parish Church of St Bartholomew, Milehouse, site of 'Outlands,' birthplace of Captain Robert Scott. 288 - Docks Parish Church, site of Scott memorial service. 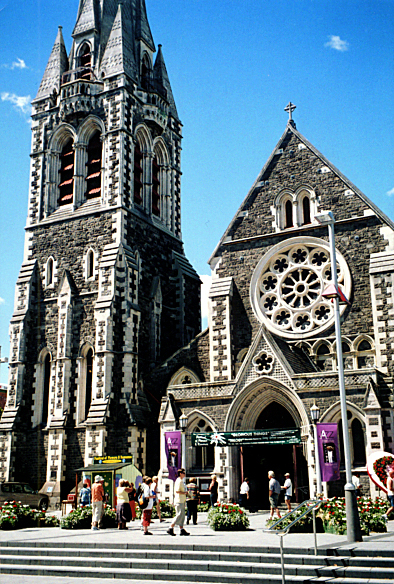 312 - St John's Church, site of Scott memorial service. 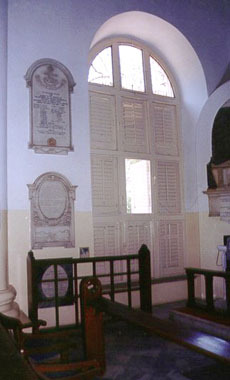 412 - St Stephen's Church, site of memorial window to James Robert Denniston, Terra Nova expedition. 430 - The Whalers Church. 462 - St Andrews Old Church, site of Scott family graves. 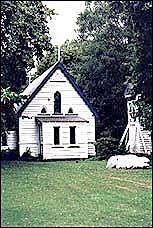 506 - Church in Inniskilling, site of a possible L.E.G. Oates memorial. 508 - Christ Church, site of marriage of Ernest H. Shackleton. 578 - Church of St Mary Magdalene, site of marriage of Edward A. Wilson. 581 - Parish Church of St Peter, site of inscribed cross in memory of Edward A. Wilson. 595 - Parish Church of St Helen, site of Sir Clements Markham memorial. 604 - St John the Evangelist churchyard, site of grave of J. Gordon Hayes. 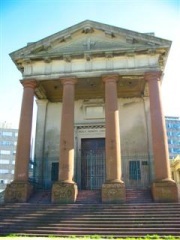 623 - The English Church, site in Montevideo of service for Shackleton. 644 - St Margaret's Church, site of marriage of Apsley Cherry-Garrard. 711 - St Mary's Church, site of christening of Frank Bickerton. 726 - Church of the Holy Rude churchyard, site of grave of Sir James Wordie. 733 - Dunblane Cathedral, site of a Scott party memorial window. 743 - St Columba's Church, site of marriage of Sir James Wordie. 764 - St Botolph's Church, site of memorial to Joseph Gilbert and Robert Rollett of Cook's Second Voyage. 777 - Holy Trinity Church, site of memorial to Francis Croizer. 778 - Church of St Peter and St Paul, site of memorial to George Vince. 780 - St Martin's Church, site of stained glass memorial window for Edward Joseph Bird. 867 - Ripon Cathedral, site of memorial to John Elliott. 884 - Parish Church of St. Anne, site of memorial to Henry Foster. St Helen's + St Peters Church, site of a Cherry-Garrard memorial . "Apsley G. B. Cherry-Garrard (1886-1959), assistant zoologist on Scott's Last (Terra Nova) Expedition is buried at Wheathampstead, Hertfordshire, England, just north of St Albans, an easy day trip from London. In the lovely parish church of St Helen's + St Peters (Wheathampstead) is a statuette of Cherry-Garrard in a niche in the north transept. I first learned of it from a short mention and photograph on page 68 of the May 17, 1986 issue of "The Field." 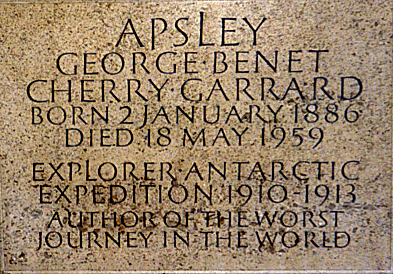 Below the standing figure of "Cherry" (depicted in polar clothing) is a carved stone plaque that reads: 'Apsley George Benet Cherry Garrard Born 2 January 1886 Died 18 May 1959 Explorer Antarctic Expedition 1910-1913 Author of The Worst Journey in the World'." The material is bronze and is by Ivor Roberts-Jones. 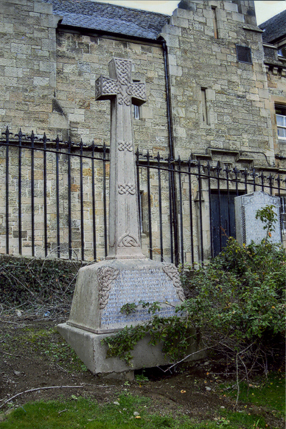 The celtic cross in the foreground in the photograph of the church marks Cherry's grave. Large New Zealand flag apparently taken to Antarctica by Sir Edmund Hillary in 1957. "the flag is within Christchurch Cathedral (north transcept)." 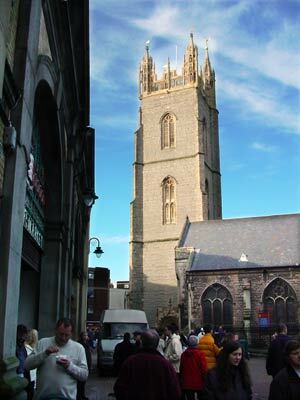 "The Cathedral is situated in the heart of the City in Cathedral Square and is home to two Memorial Plaques. The first is situated on the outside wall directly below the tower, the second is situated inside the Cathedral in the North Transept. The outdoor plaque is a memorial to all those who have given their lives to Antarctica and was unveiled at an Antarctic International Memorial Service in October 1973. The internal plaque is also a memorial and was presented to the people of New Zealand by the officers and men of Operation Deep Freeze in 1955." There was a memorial service in the Cathedral when the Terra Nova came back to New Zealand. Cherry-Garrard attended. Source: Sara Wheeler, Cherry, p.153. "In the north transept are the USA and US Antarctic Programme flags presented to the Cathedral by the Programme. There is a plaque presented in 1955 to the people of New Zealand by the US Navy, commemorating all those explorers who have headed south. On the outside of the tower, facing the Square, is a further plaque in memory of those who have lost their lives in Antarctica, presented at an Antarctic International Memorial Service in October 1973. 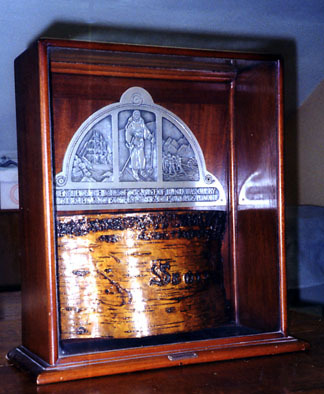 The silver and gilt chalice used in services at the Chapel of the Snows at McMurdo is committee to the care of Christ Church Cathedral during the winter months and is handed over to the chaplain accompanying the southbound Antarctic team each year. It was given in 1987 by Miss Betty Bird to commemorate the 75th anniversary of Robert Falcon Scott's visit and death at the South Pole in 1912. The chalice accompanied Miss Bird's great-great uncle, then Lt. Joseph Bird, to the Antarctic with Sir James Clark Ross' 1839 expedition." Antarctic Connections. Christchurch, New Zealand,' Christchurch City Council, 2004. St Andrew the Great Church, site of Captain Cook memorial. St Andrews Street, Cambridge, UK. 14th day of February, 1779; in the 51st Year of his Age. who died on the 21st of December, 1793; aged 17 years. he commanded; in the 31st Year of his Age. in the middle Aisle of this Church." According to the brochure, St Andrew the Great, Cambridge: A History, Cook's wife "left �1000, the dividend of which was to be used to maintain her monument." St Paul's Cathedral, site of Scott Polar Party memorial. The memorial is located in the South Transept of the Cathedral. It was unveiled by Prime Minister Asquith on May 5, 1916. 'In Memory of Captain Robert Falcon Scott, C.V.O, R.N., Dr. Edward Adrian Wilson, Captain Lawrence Edward Grace Oates, Lieut. Henry Robertson Bowers, and Petty-Officer Edgar Evans who died on their return journey from the South Pole in February and March 1912. Inflexible of purpose--steadfast in courage--resolute in endurance in the face of unparalleled misfortune--their bodies are lost in the Antarctic ice--but the memory of their deeds is an everlasting monument.'" Source: An unidentified newspaper clipping. The Pall Mall Gazette of May 5, 1916, also carried an article. My visit of 2/2/98: The memorial is bronze, ca. 4 feet tall by 2 feet wide. Mounted on the east wall of the south transept, very close to the elevated pulpit. In the center is a bas relief of Scott. Below that are five men pulling a sledge. At the top are three classical figures. At the bottom is the inscription. Above Scott's head is the inscription all in caps: "Death is swallowed up in victory." 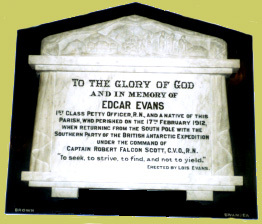 "On October 25 a bronze tablet in memory of Captain Oates was unveilled by Commander Evans in St. Anne's Church, Eastbourne, in which the deceased officer was accustomed to worship." Source: The Geographical Journal Vol 42, No 6, p.577, December 1913. The memorial is mentioned on p.168 of Captain Oates, Soldier and Explorer, by Sue Limb and Patrick Cordingly. There is a photograph of the plaque in The Observer. 26 October 1913. The caption mentioned that it is in the south transept. The Mayor and the Archdeacon of Hastings were at the dedication, 25 October 1913. Apparently "on another tablet is a record of the pathetic circumstances under which the gallant officer forfeited his life:"
"He had suffered intensely from frostbite for weeks without complaining but on March 16, it was evident that he was failing fast. He was a drag upon the party. He put their chances of safety in jeopardy, yet, of course, they could not leave him. On March 16th he went to sleep in camp hoping not to wake, but he did wake the next morning. It was his birthday and he was 32 years old. He was born March 17th, 1880. He said he was just going outside and might be some time. The others tried to dissuade him but he walked out into the blizzard and was never seen again. He had evidently thought out the situation and recognized clearly that for him to stay meant death to all. He tried to save his friends by losing his own." In January 1998 I searched for this site to no avail. Hartfield Road is close to the center of Eastbourne but the only church on the road is a small evengelical church which couldn't possibly be it. There was no St Anne's listed in the phone book. Before a second visit to Eastbourne in 2007 I e-mailed Michael Smith to see if he knew anything about the plaque. 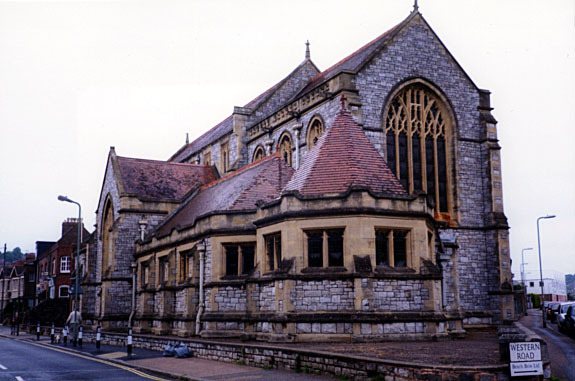 He made a few enquiries and learned from the Eastbourne Reference Library that "St Anne's church was destroyed by incendiary bombs on the night of August 11th 1942 after surviving several near misses. The entire building was completely gutted due to the fire that ensued. 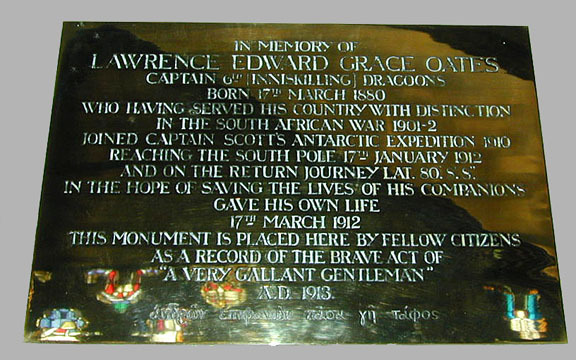 I have not yet found any reference to a memorial stone for Captain Oates." Parish Church of Holy Trinity (Meanwood Church), site of L.E.G. Oates memorial. Church Lane/Memorial Drive, Meanwood, UK. 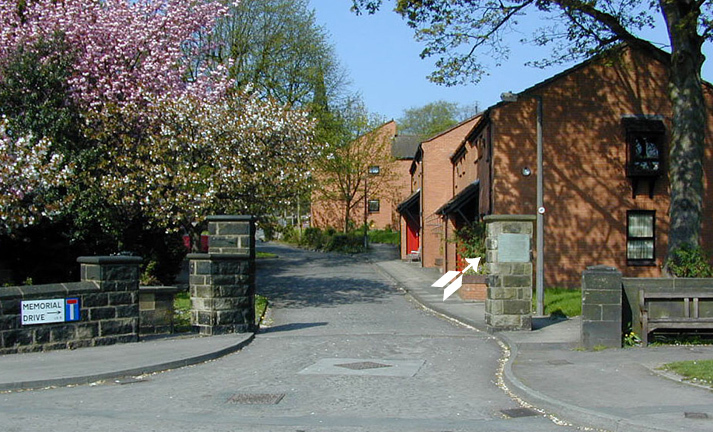 My visit of 10 May 2001: Meanwood is a northern suburb, 2 or 3 miles from center of Leeds. 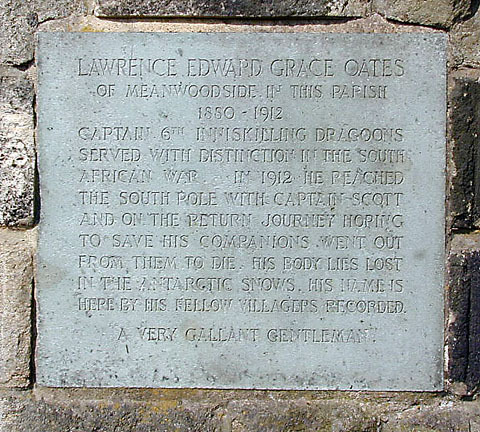 The memorial to Oates is not in or on the church but on the easterly post at the start of Memorial Drive which runs from the main road (Green Road) up a parking area at the edge of the churchyard. here by his fellow villages recorded. Apparently the Oates family owned at one time most of this area of Leeds hence the connection. There is a booklet I saw at the Leeds Library (Lawence Oates and Antarctica 1912-1962, 12pp published by the Leeds Public Libraries) that said that Caroline Oates (nee Buckton) [Oates's mother] had lived at West Lea, Meanwood. St Peter-at-Leeds, site of L.E.G. Oates memorial. 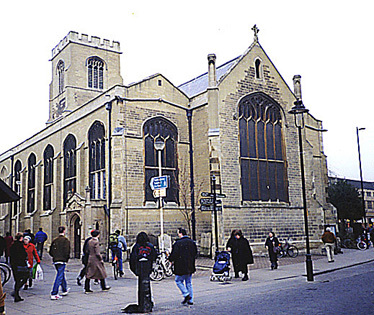 My visit of 10 May 2001: The church is a large church on the east side of central Leeds. The plaque is in the tea room on the northside of the church. and on the return journey Lat 80°.8'.8". 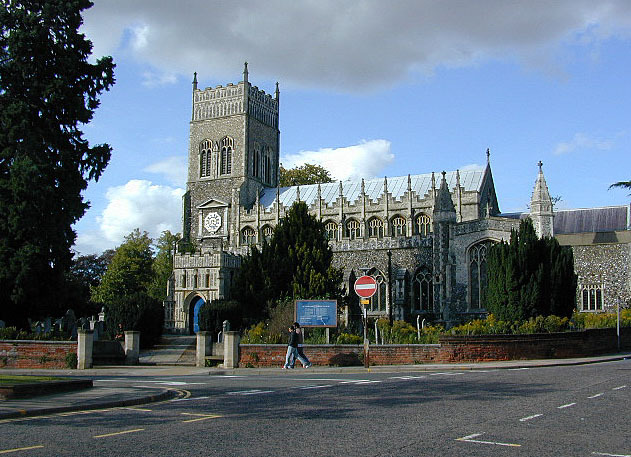 St Mary the Virgin, site of L.E.G. Oates memorial. 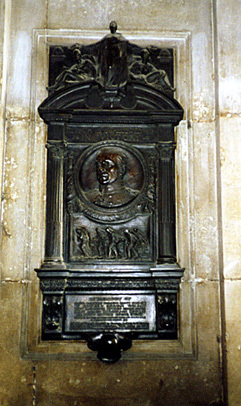 Brass memorial placed in the north wall of the church. Says, in part: "In affectionate remembrance by his brother officers." "Every week, almost to her dying day, Caroline Oates would clean it." His Brother Officers AD 1913"
"Next to Scott himself, Captain Oates is surely Antarctica's most tragic hero. His self-sacrifice on the return from the Pole is well known and his last words, recorded in Scott's journal, are often quoted: "I am just going outside and may be some time." Laurence Edward Grace Oates, often called "Titus" or "Soldier," was born (1880) and died (1912) on the 17th of March. He grew up mostly in Essex in the small village of Gestingthorpe. The family house, Gestingthorpe Hall, just visible from the road, is a large rambling Georgian place that dates from the 17th century. On the death of his father, the sixteen-year-old Oates became lord of the manor. His mother continued to live in the house--she permanently moved into her son's spartan bedroom upon learning of his death--as did his sister, Violet. The property left the family in 1946 or 47 and is again on the market. For �550,000 any ardent Antarctican can purchase it. 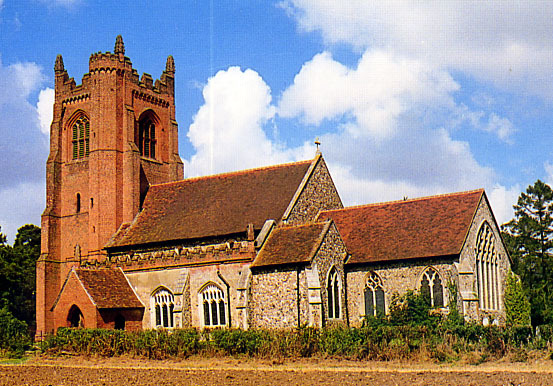 Across the road from the Hall stands the brick and flint St Mary the Virgin Church, the oldest part going back to the 13th century. Its roof, of the double hammer-beam type, is considered one of the finest in Essex. In modern times the major benefactor of the church has been the Oates family, many of the restorations being supported by their gifts. The fifth of six bells was recast in 1901 as a thank-offering for the safe return of Captain Oates from the Boer War. 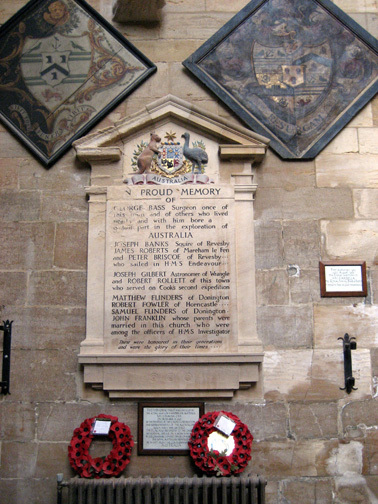 The most noticeable item of Oates interest in the church is, however, the brass memorial plaque that was installed on the north wall and unveiled by General Allenby on November 8th, 1913. . . . The brass, which is approximately 2 by 3 feet, is set on a dark stone backing which at the top has a brass depiction of the Inniskilling Dragoons device." Source: 'Low-Latitude Antarctic Gazetteer, Episode 62. Posted 5/31/98. St John the Baptist, site of Frank Wild memorial. Church End, Eversholt, Bedfordshire, UK. The plaque was unveiled Sunday 16 December 1973; officiated by the Lord Bishop of St Albans, the Rt. Rev. Robert Runcie. "Frank Wild spent his boyhood in Eversholt where his father, Benjamin Wild, was village schoolmaster ... Among those attending the service were Wild's two surviving brothers, Mr S. and Mr L. Wild; the Hon Charles Shackleton, grandson of the explorer; and Dr Gordon Robin, who represented the Scott Polar Research Institute and the Royal Geographical Society." Source: Polar Record, Vol 17, No 107, May 1974, p.170. Eversholt was "the family home for 23 years ... and from whence Frank Wild set off in 1901 to join Captain Scott on his first Antarctic Expedition." Source: Letter to H.G. R. King from Stanley O.W. Wild, 17 July 1972. Mason's specifications: One slate tablet, size ca. 24" x 12" x 1". Source: Handwritten single page document at Scott Polar Research Institute. "If Oscars were given out to Antarctic explorers, Frank Wild would surely have picked up a few in the 'best supporting' category. Can anyone else claim to have participated in five 'heroic age' expeditions? His five: Scott's Discovery expedition, Shackleton's Nimrod, Endurance and Quest expeditions and Mawson's 1911-14 expedition. Born in 1874 in Yorkshire, he died of pneumonia in 1930 in the Transvaal where he raised cotton, unsuccessfully. I visited Eversholt in January of 1998. Close to Woburn, it is a lovely little village. The church was locked but I fetched a key from a man at Church Farm across the way. He pointed out the nearby house that he thought was Wild's. This fellow alone was worth the trip: he restores vintage racing cars and keeps peacocks, which were wandering around the village, llamas and wallabies! Source: 'Low-Latitudfe Antarctic Gazetteer, Episode 33. St Mary's Church, site of the Sir Reginald Skelton memorial window. Aldingbourne nr Chichester, West Sussex, UK. "Memorial to Vice-Admiral Sir Reginald Skelton. 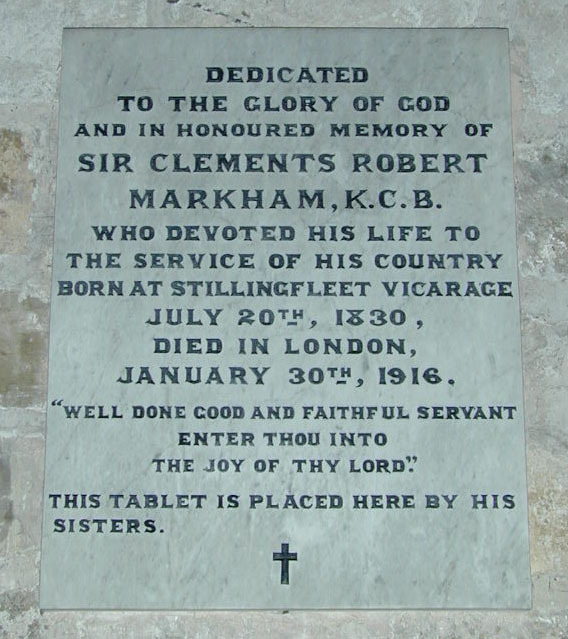 On 24 June Canon Jolly, Vicar of Aldingbourne, near Chichester, told me that the Skelton family were putting a stained glass window in his church to commemorate the late Admiral. Skelton's antarctic activity is to be symbolised by an Emperor Penguin, since he discovered the rookery at Cape Crozier in 1902 on the "Discovery" expedition. Canon Jolly wanted to get the facts about this straight, since he knew that whatever notice of explanation he put under the window would be examined in detail by the numerous retired Admirals in his congregation. I gave him the necessary references with the help of A.M.S., and a copy of the "Polar Record" No. 55 with Skelton's obituary in it. My visit of 1/31/98: This lovely church set within an equally lovely churchyard was closed when I visited so I could not confirm existence of window. I wandered through the churchyard and saw no gravestone for a Skelton. My visit of 6/9/99: The church is open in the afternoon during the summer. I visited and took several photos. Skelton is not buried in the churchyard. The groundskeeper was there and he guessed that he was buried at sea. 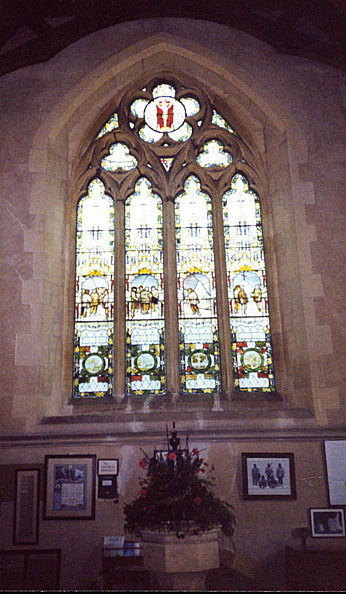 The window in the south wall is by Christopher Webb. The inscription at the base of the window reads: "To the honoured memory | of Engineer Vice-Admiral | Sir Reginald Wm. Skelton, K.C.B,. | C.B.E., D.S.O. who died 6th Sept 1956. | The gift of his three children." The left panel includes an Emperor penguin, the right a submarine. The center has an angel holding a globe. St Mark's Church, site of the Robert Scott oak statue. Cambridge Road, Ford, Devonport, Plymouth, UK. Source: The Times, 13 January 1956. The statue was dedicated by the Bishop of Exeter, Dr. Mortimer. The statue, carved from English oak, is the work of a young Plymouth sculptor, Mr. David Weeks. At the service the lessons were read by Mr. Peter Scott, the explorer's son, and the Lord Mayor of Plymouth, Mr. Edwin Broad. Extracts from Captain Scott's journal and last letters were read by Admiral Sir Mark Pizey. 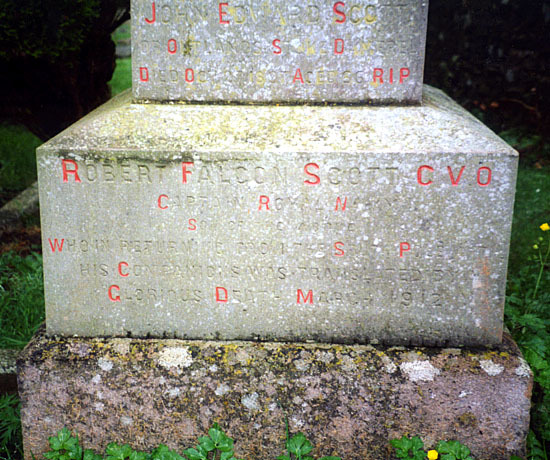 Mr. Isaac Foot, in a tribute, said there were a number of memorials to Scott in many parts of the world, including one at Mount Wise, Plymouth. He hoped that the city's schoolchildren would always remember Scott's birthday and he thought it would be an opportunity for them to make an annual pilgrimage to the memorial. Sitting in a choir stall near the statue were four men who had known Captain Scott. They were Lieutenant-Commander F.E. Dailey. R.N., retired, a member of the first expedition, Mr. F. Parsons, a coxswain on the Terra Nova, Mr. G. W. Warren. a signalman on the Terra Nova, and Mr. W. Hands, who was a fellow chorister at St. Mark's." Source: The Times, 16 January 1956. Source: Manchester Guardian, 16 January 1956. My visit of 5/29/99: Located in a densely developed area of terraces, somewhat dingy. The church itself (located not far from Outlands) was not open and looked somewhat dingy as well. There was nothing on the notice board. I learned later that services are held here on the first Sunday of each month. Scott was a choir boy here. There is a picture of Scott as a boy in the vestry of the church according to a write-up found in the reference department of the Plymouth Library. The oak statue stands behind the choir stalls. The church was built in 1874. Emmanuel Parish Church, site of the Robert Scott memorial window. Corner Okehampton & Western Roads, Exeter, Devon, UK. 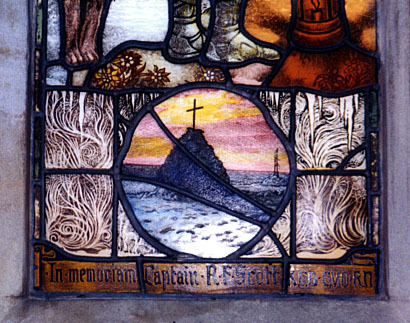 A memorial window to Captain R.F. Scott was unveiled in Emmanuel Parish Church, Exeter, on Saturday, by Captain E.R.G R. Evans,. D.S.O., R.N., who was Captain Scott's second-in-command on the last voyage in the Terra Nova. The vicar (the Rev. C.H. Williams) officiated, assisted by the Rev. H.G. Phillips. 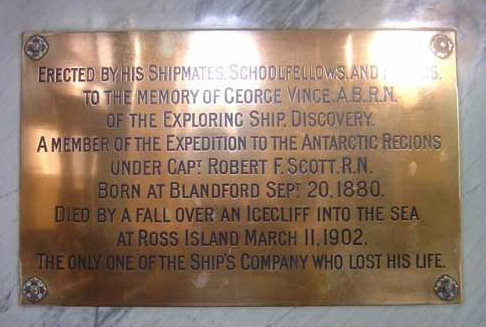 The window, which has been erected by an anonymous donor, includes a portrait of Captain Scott and a picture of the grave at One Ton Depot, on the Ross ice barrier, where are buried the explorer and his companions, Dr. E.A. Wilson, chief of the scientific staff, and Lieutenant H.R. Bowers, who perished together. 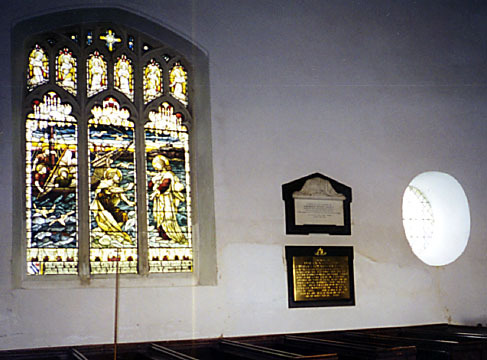 Captain Evans said it was fitting that the window should be placed in a Devon church because Captain Scott was born and bred in Devonshire and he loved and was proud of his county. Many times since Captain Scott's death he had been asked, 'What is the good of Antarctic exploration?' The answer, quite apart from the scientific results, was that men could still be found who would give their lives for an ideal. All who had read Scott's last message must have realized that when the pencil dropped from the great explorer's dying grasp, whatever the hardship and pain, Scott felt that he had done his duty to his country, to the Naval Service, and to his fellow-men." Source: The Times, 3 March 1924. My visit of 5/27/99: After some false starts I finally gained entry via Mr C. J. Carpenter, 52 Wardrew Road, Exeter, Devon EX4 1HA, a nice old man who's been a member of the church for 60 years or so. The window is in the south transept. It was blown out by a bomb on 23 April 1942 and restored in 1948. The church is about to celebrate its centennial. There are three images: Scott portrait (right window at base), the Snow Cairn Grave (left window at base) and the Terra Nova (middle section of the right window). I recorded the wording: Under the snow cairn: "In memoriam Captain R. F. Scott KCB, CVO, RN." Under Scott's portrait: "Who gave his life in the cause of science | and for the glory of his country's name." There is a bronze plaque underneath: "In memory of Fred Endacott and of Lettie his wife of this parish. This window was restored, April 1948." St Peter's Church, site of Scott Party memorial windows. If Captain Scott, who knew and loved Binton so well, could see the Warwickshire village to-day, he would find that it had changed very little. The church and cottages built of that clean blue local stone, the fruit trees on the slopes against woodland background, present the same picture; and some of the villagers the famous explorer chatted with are still there. The primroses are shining gold on the glassy banks with which the village abounds, the beech trees round St. Peter's Church are in tiny leaf . . . as they were when Capt. Scott was there about 40 years ago to say what proved to be his last farewell. The church? Yes, the church has changed a little. Its West window is a peace-time memorial. Four scenes in the cold tints of the stained-glass tell the story of Capt. Scott and his companions in the South Pole Expedition which ended in the gallant party's deaths in March, 1912. In 1915 the window was unveiled by the Duke of Newcastle. Last Sunday evening Binton folk led by their Rector and choristers performed an act of remembrance. Facing the window they recalled the courage, endurance, Christian fellowship, loyalty and sacrifice of Scott and his companions. In the service which followed they sang three hymns which echoed through the church 34 years ago, "We love the place, O God," "Eternal Father" and "O God, our help in ages past" they were. The 1915 dedicatory prayer was repeated. One other change at Binton is a recent one and personal. Just a year ago there came to the village the Rev. 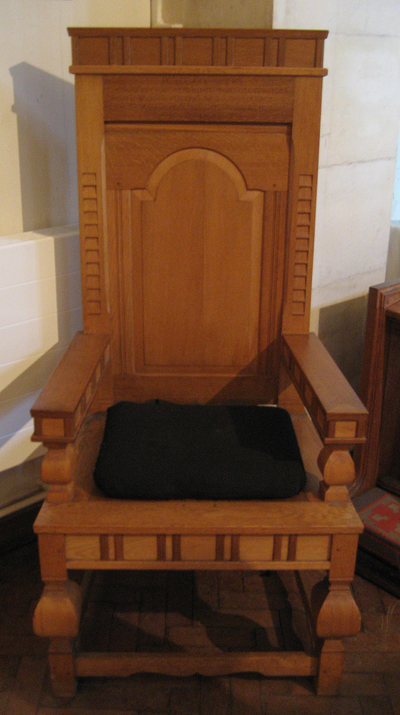 J. Emrys-Jones to take over the rectorship held from 1906 to 1924 by the Rev. Lloyd Hervey Bruce, brother of Capt. Scott's wife. 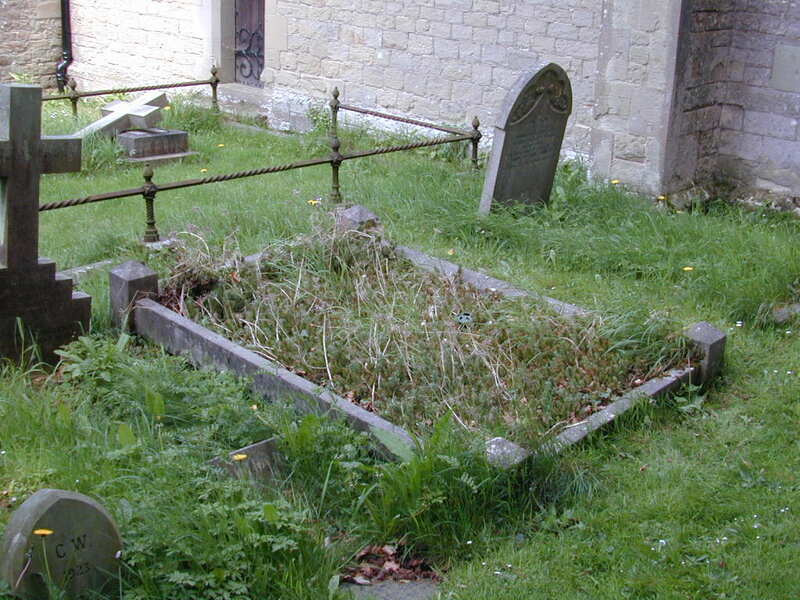 The former rector's grave on the Southern side of the church is marked by a bronze crucifix designed by Lady Scott. The young rector, an admirer of Scott from his tenderest years, stood up in the pulpit facing the Scott window and, with the clear, steady voice of the true devotee, paid his tribute to a great man and his little band of great men. The beautiful window commemorates a glorious failure, a stirring story which has been, sadly enough, somewhat effaced by the sorrows and sacrifices or two major wars. Amundsen, the Norwegian, outraced Scott to the South Pole and it was a bitter moment when the British explorers discovered that the had been there first. But for all time the South Pole will be inseparably associated with Robert Falcon Scott. Defeat? It has been said that the British are inclined to exalt defeat. "But," said the Rector, "It is surely not the defeat we honour but the spirit in which it is met and matched, whether of the humble schoolboy struggling gamely home at the end of the race or of men battling grimly to the beaches of Dunkirk." Some people had doubted the value or good of the Scott expedition. Were our values so tinged with materialism and security-worshipping spirit of modern life that we could see no value in anything which did not produce tangible reward in the shape of wealth or power, or to put it on a higher plane, or knowledge and liberty? Important scientific data was gathered by Scott and his colleagues. Even so no measure of wealth or knowledge could be set against the power of the example that these men gave to others. Boys, young men and older ones have gained courage and inspiration from what was done so finely by those men without sense or need of dramatics. The young Rector who in the second world war volunteered for aircrew duties with the R.A.F., recalled his own boyhood and his reaction to the Scott story of fine endeavor. "I well remember the formative influence that it played in my young days," he said. "Never have I failed to thrill to its greatness, never has it failed to add to an otherwise meagre stock of courage." That story which with its example of courage and Christian fellowship had stirred the hearts of Englishmen everywhere, was the true value of Scott and his companions in their failure�a glorious failure. "True success or failure lies not in the achieving or otherwise of any goal but in the degree of character attained and revealed; in the quality of mind and soul not the quantity of result, especially in the dark things of defeat." Having emphasised that their sacrificial fellowship transcended all bounds of fear and disaster, the Rector said that Scott and his companions decided that come what may, they would stand by each other to the very last. "How magnificently that resolution was kept was shown when first Evans and then Oates were stricken. It was just possible that their refusal to leave the injured Evans would not have resulted in the loss of all, despite the appalling weather, but when Oates succumbed to frost-bite and they measured their pace by his, then the decision for death was made. Oates, by his action, gained an imperishable place in history but fellowship had already begun to pay the price in full for adherence to that principle . . . The loyalty in distress was surely the principle that must govern all life whether in the blizzards of the antarctic or amid the soul-tremors of a post-war world. "These qualities combined in Scott and his companions reveal the essential dignity of man. By the dignity of man we mean that spirit which refused to bow down before the force of any circumstance, which refused to sacrifice things of enduring worth for the sake of a few years of added life and, before the ruthless challenge of that treacherous world of the Antarctic snow and ice and gales, fearlessly maintained a resolution of mind, strength of character and nobility of soul. A dignity that reached its peak when they each determined not to take the easy way out but 'would stick it to the end.' Their's indeed was the fullest expression of manhood, a manhood that surely was founded in a quiet but unmistakable fellowship with God." Source: Clipping from unidentified newspaper, 9 April 1949. My visit of 1/27/98: In a corner near the windows is an alcove display on Scott and his expedition including photographs, maps, etc. One panel describes the Binton Connection: "In 1908 Lloyd Hervey Bruce became rector of Binton in succession to his brother, the Rev Douglas Bruce. They were the brothers of Kathleen Bruce, who married Captain Robert Falcon Scott on September 2nd, 1908. Prior to the second expedition to Antarctica, Captain and Mrs Scott visited Binton on several occasions and it is said that Captain Scott and his wife spent their last weekend in Binton. A local resident still living in the parish remembers Captain Scott visiting the school with the Rector. Whilst there is no recorded information, it is stated that local children and residents collected towards the cost of a husky. The Terra Nova had left London on June 1st 1910 sailing via Cardiff, leaving there on June 15th, 1910. But Captain Scott only sailed with the ship as far as Greenhithe and then returned to London. On July 16th 1910 Captain and Mrs Scott left Britain on board HMS Saxon to join the expedition ship in South Africa. Following the announcement of the sad and tragic end to the expedition, on February 11, 1913 stories of the events were read to children attending Binton School as shown in the school log. Further on in the log during the week of September 19, 1913, Lady Scott, her son Peter Scott, the Rector, Dr Bruce, visited the school. The resident mentioned earlier has indicated that during the period of the expedition Peter Scott was a regular visitor to the Rectory." Rev. Lloyd Hervey Bruce, brother of Capt. Scott's wife and the former rector, is buried on the southern side of the church. 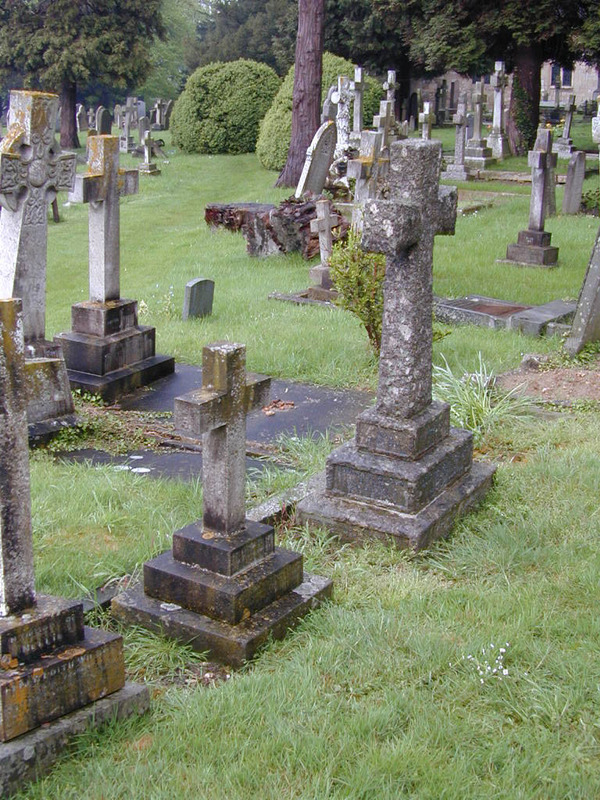 The grave is marked by a bronze crucifix designed by Lady Scott set within a wooden cross. Carved in the wood: "Lloyd Hervey Bruce, Rector, Binton 1906 to 1924. 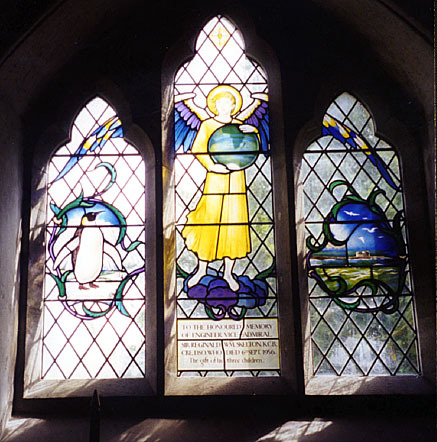 'The earth is full of the majesty of glory'" The window, at the rear of the church, has four vertical panels above which are two trefoil windows above which is cinquefoil window. In the left trefoil is a depiction of the Terra Nova, on the right a depiction of the Snow Cairn and date Nov 12. 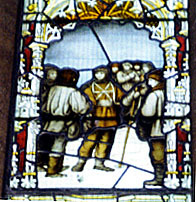 The left panel: Depicts Scott and his four companions setting out on the final dash to the South Pole: "Here Captain Scott with his brave companions full of zeal to plant the British flag at the South Pole receive their last farewells on their way south." Second from the left panel: The discovery of Amundsen's flag: "Here the intrepid explorers coming upon the flag of Amundsen learn with great disappointment that the Norwegian expedition has forestalled them." 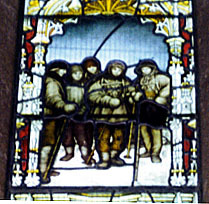 Second from the right panel: Captain Oates, that "gallant gentleman," going out into the blizzard to die rather than be a burden to his comrades: "Here Captain Oates, that brave and gallant gentleman, unwilling to be a burden to his companions leaves them in the shelter of the tent to die." 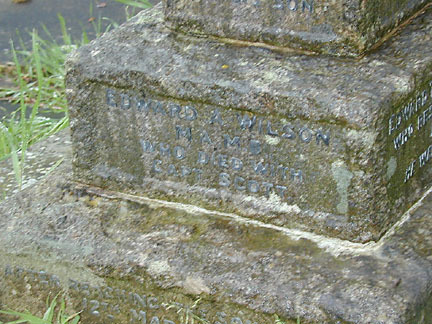 The right panel: Discovery of the tent in which Scott, Bowers and Wilson died: "Here the Search Party erect a cairn to mark the last resting place of their gallant countrymen, Captain Scott, Dr Wilson and Lt Bowers." St Mary's Church, site of Eric Platt memorial window. Cotton Stones, West Yorkshire, UK. A richly coloured stained glass window, which Mr. and Mrs. John Platt, Prospect House, Soyland, have provided at St. Mary's Church, Cotton Stones, in memory of their son, Mr. Eric Platt. B.Sc., who died in the Antarctic, is to be dedicated at a special service on Sunday afternoon. The dedication will be performed by the Rev. G. L. Barber, former Vicar, and the present Vicar, Rev. W. I. G. Moffatt. will conduct the service. Mr. Eric Platt, a former prefect at Sowerby Bridge Grammar School, died in 1948 whilst working in the Antarctic as a member of the Falkland Islands Dependencies survey team. He had been associated with St. Mary's Church and school, was a member of the choir, and at one time the occasional organist. He had also been an altar server. The main colour schemes of the window are steel.blue, a deeper blue, red and gold. There is the life-size figure of a knight in armour, with sword raised in his right hand and holding a shield in his left hand. On the shield is a lion rampant. At the top is a crown and lamp, also two angels. At the side of the knight is a chalice, and the design also includes a knight's helmet, a lion, a dove and other features. In bold letters underneath the figure, is the word, "Courage." The window is the work of George Maile and Sons. Ltd., London. Mr. Kenneth Pawson, of Triangle, another Sowerby Bridge Grammar School old boy, who has been in the Antarctic as a member of the expedition, is now on his way home but cannot be back in time to take part in Sunday's Service." Source: Halifax Courier, 14 April 1950. My visit of 11 May 2001: Church was open as it is also used for a children's playgroup. In the back, where the playgroup meets, is the window. It's a tiny village. The inscription is in the lower portion of the window. 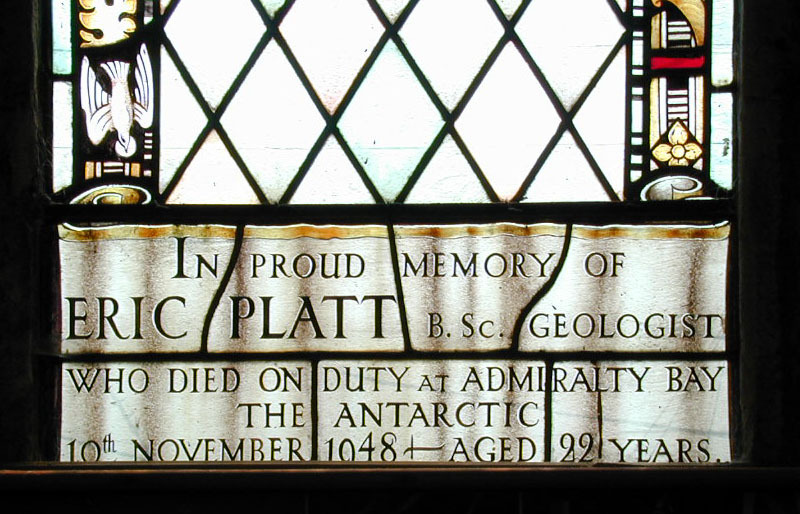 It reads: "In proud memory of | Eric Platt B.Sc., geologist | who died on duty at Admiralty Bay [no comma] | the Antarctic [no comma] | 10th [no of] November [no comma visible] 1948, aged 22 years." St James the Great Church, site of a memorial window and the grave of Sir James Clark Ross. Aston Abbots, Aylesbury, Bucks, UK. 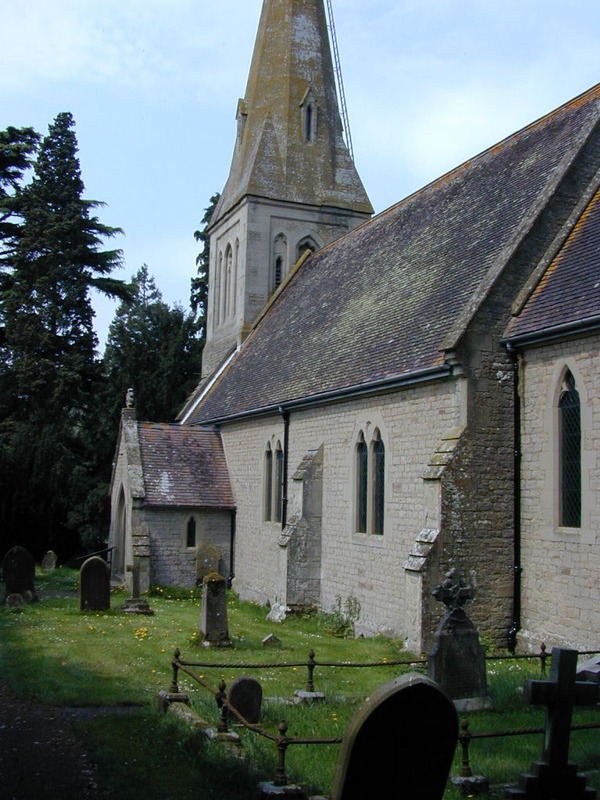 "Near the entrance drive to the house stands St James the Great, the handsome village church. The east window bears a memorial inscription: 'To the glory of God and in memory of Rear Admiral Sir James Clark Ross and of Ann his wife.'" 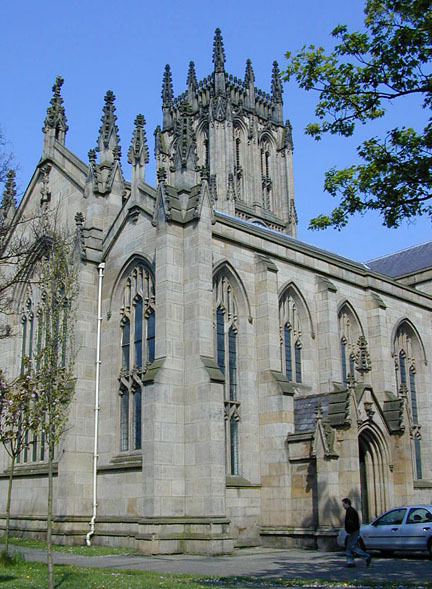 St Thomas Cathedral, site of 'Birdie' Bowers memorial. the Pole on or about the 27th March, 1912.
and indomitable to the end." zeal and integrity at all times." Source: The Geographical Journal, September 1914. Minor corrections made to text based on actual lettering on memorial. Photos courtesy of Russell Kevin Coote. St Ninian's Church, site of 'Birdie' Bowers memorial. Shore Road, Port Bannatyne, Isle of Bute, Scotland, UK. 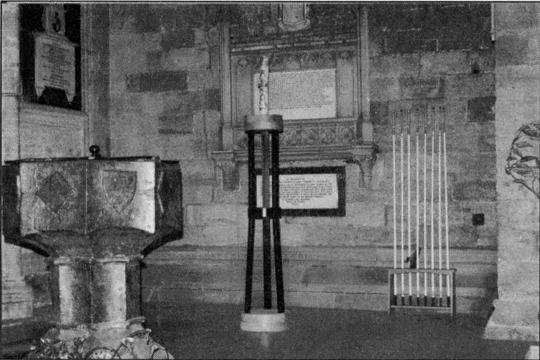 My visit of 10 May 2001: The plaque is to the left of the altar as you face it. It looks and reads the same as the one in Bombay. Rothesay is on Bute not far from Greenock where Bowers was born on July 29, 1883. 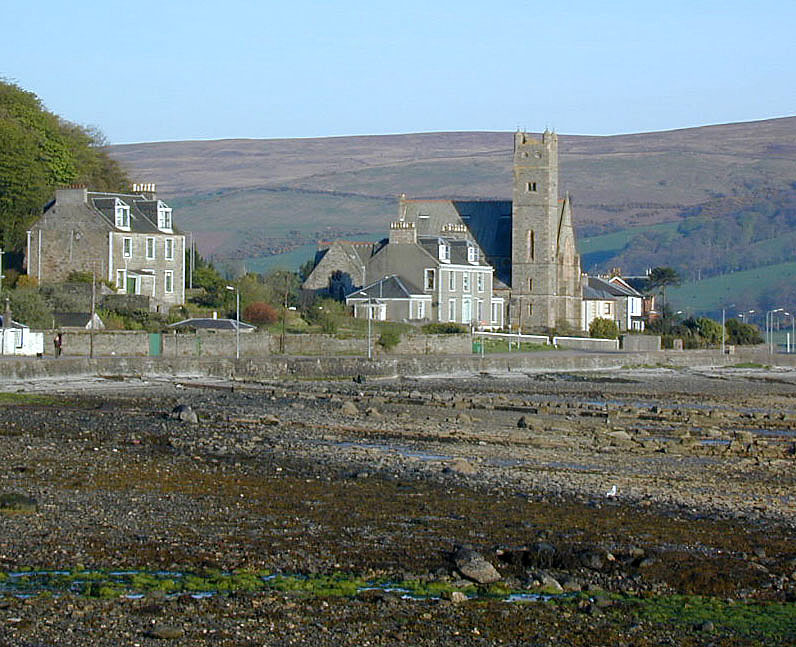 The church is actually in Port Bannatyne which is a mile or so north along the coast from Rothesay. 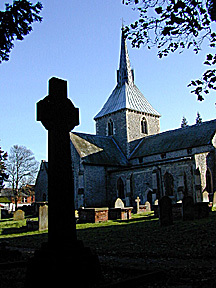 Church of St Mary the Virgin, site of memorial to Petty Officer Edgar Evans. The Collegiate & Parish Church of Swansea St Mary, site of an oak chair in memory of Petty Officer Edgar Evans. Princess Way, Swansea, Wales, UK. "Also in Swansea at the Collegiate & Parish Church of Swansea St Mary is a memorial oak chair made by Mr Gwyn Morris and presented in 1978. Its inscription: 'In memory of C.P.O. Edgar Evans. One of Captain Scott's ill-fated party of five to lose their lives after reaching the South Pole on January 17, 1912. He fell on Beardmore Glacier on February 4 1912, and died on February 17 1912, at Lower Glacier Depot.'" St Cuthbert's Church, site of baptism of Captain James Cook. Stokesley Road, Marton, Yorkshire, UK. "Captain James Cook R.N., F.R.S., circumnavigator, baptised here 3rd November, 1728." Captain Cook was baptised here and his entry in the Parish Register is displayed. Key available at the Parish Centre or vicarage when the church is locked. An interpretive panel outside the Parish Centre tells you more about the significance of this site. Open Mon-Fri, mornings and evenings. St Margaret's Church, site of Captain Cook's wedding. 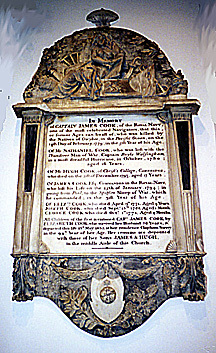 James Cook was married to Elizabeth Batts in St Margaret's church, the parish church of Barking, on the outskirts of London. The date would be sometime in December 1762. She signed the register: "Elizabeth Cook late Batts." Source: Alan Gurney, Below the Convergence; Voyages toward Antarctica 1699-1839, p.95. 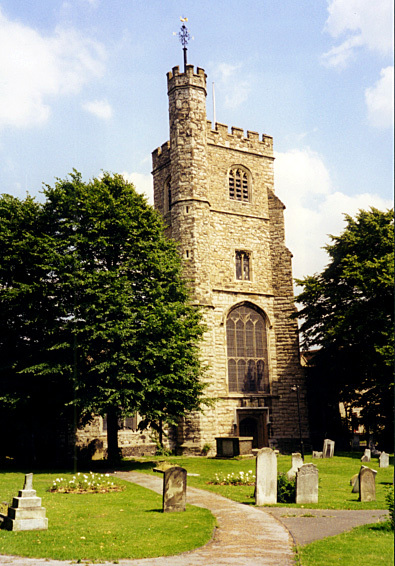 St Margaret's Church is on the site of Barking Abbey. The marriage register recording Cook's marriage has been removed to an off-site archives. There is nothing in the church related to Cook. 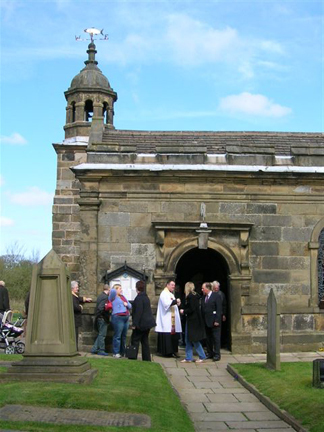 Parish Church of St Bartholomew, Milehouse, site of 'Outlands,' birthplace of Captain Robert Scott. Outlands Road, Milehouse, Devonport, Plymouth PL2 3BZ, UK. Robert Falcon Scott was born here on 6 June 1868. My visits of 5/29 and 5/30/99: A modern church was built on the site of the house which was damaged during the war and was torn down. Site was purchased in 1944 and foundation of church laid in 1958. Name is: Parish Church of St Bartholomew, Milehouse. There is a circular iron plaque on the stone wall around the church at the corner of Outland Road and Scott Road on the Scott Road frontage. The wood plaque is on a post at the entrance drive. Within the church parish hall which is next to the church, on the 2nd floor (1st UK) is an artifact, a large piece of a birch tree that Scott had carved his name on. It is in a glass case. The caption reads: "The name on the bark of this piece of birch was cut by Captain Robert Falcon Scott, R.N., at his home, Outlands, Plymouth." Another caption reads: "Tree felled at Outlands, 1926 (Capt Scott's birthplace) by R. J. McNeill Love, FRCS." See photo. 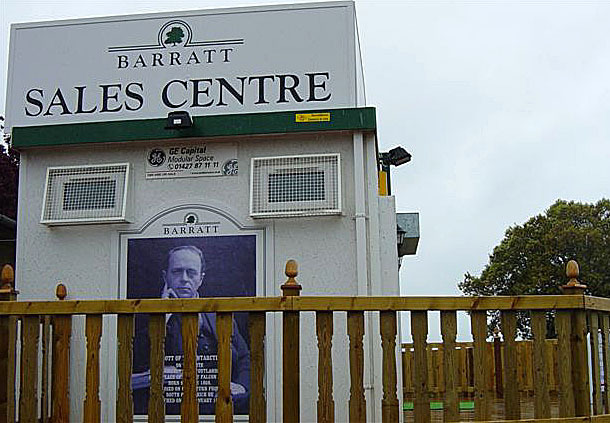 "Barrat Homes are building flats on part of the site of Scott's birthplace at Outlands--to be known as 'Explorer Court'--the names of the blocks Tuthill, Hanson and Richardson are the names of 3 young people from the area who are taking part in the Fujitsu Polar Challenge." See photo. Source: 'Polar Bytes' No 32 July 2004. "Docks Parish Church, site of Scott memorial service. Mount Stuart Square, Cardiff Bay, Cardiff, Wales, UK. 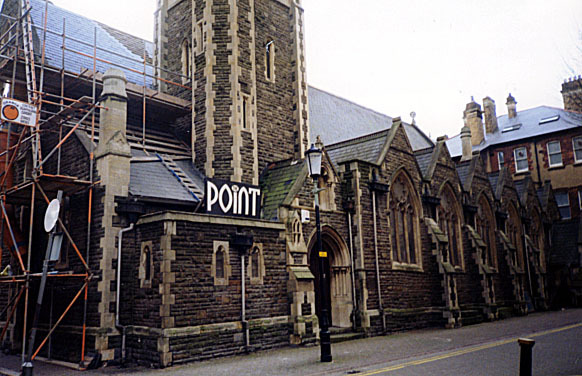 The photograph is of 'The Point,' formerly St Stephens Church and now a theatre, may have been the parish church where a memorial service was held following news of the deaths of the polar party on Sunday the 15th of June, 1913. Source: Johnson, Scott of the Antarctic and Cardiff, p.49. St John's Church, site of Scott memorial service." In central Cardiff, St. Johns was built in 1473. 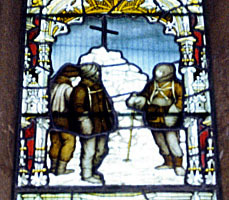 St Stephen's Church, site of memorial window to James Robert Denniston, Terra Nova expedition . Peel Forest, South Canterbury, NZ. "Stained glass window commemorating 28 year old James (Jim) Robert Dennistoun who went south from Lyttelton on Terra Nova in 1911-12, looking after the Indian mules. He later served in World War One, as an observer in the Royal Flying Corps and was shot down in a plane piloted by his cousin during a bombing raid near Le Point de Jour (France). He was wounded and died while a prisoner at Ohrdouf, Thuringia (Austria), on 9 August 1916. 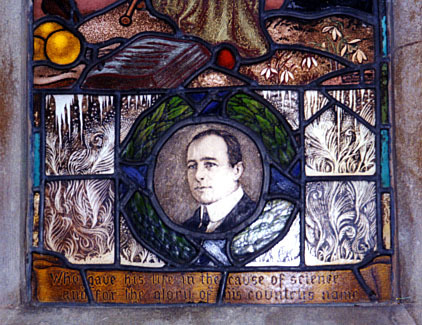 A stained glass window featuring his portrait, and a plaque, were erected to his memory. The family still treasure the quaich and his copper tobacco tin bearing the crest of the BAE (1910-13)." Source: E-mail from David Harrowfield, 11 November 1998. 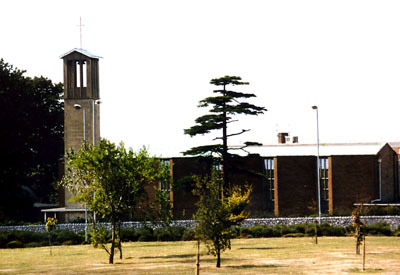 "St. Stephen's Church, Peel Forest: Located in Peel Forest village on Peel Forest Road, north of Geraldine. St. Stephen's a small wooden white weather board church was first constructed in 1868 but was blown down in the late eighties and rebuilt in 1885. The bell tower of this church was blown down in 1914. There is now a separate bell tower. One large stained-glass window "St Mary and the Christ - Child with St George and the Archangel Michael" by Joseph Nuttgens, Harrows 1922-23 commemorates father and son George James and James Robert Dennistoun. George died in Torquay, England. George had owned the Peel Forest run. The windows were donated by Emily Dennistoun, widow and mother. In the Christchurch Cathedral there is a memorial stone with a coat of of George James Dennistoun, died 1921: Adversa vitute repello. The face of St George is a portrait of a local settler and mountaineer who died during WWI, Lieut James R. Dennistoun, so there is a small representation in the bottom pane of Milford Sound's Mitre Peak as he was the first pakeha to climb it in 1910, not a difficult technical climb, the peak's tangled bush proved a formidable obstacle. Earlier attempts to climb Mitre Peak had failed. The mountain rises 1,692 metres above the Sound. The second ascent of Mitre was made in 1914 but there was a long gap until the third ascent in 1941, James of the North Irish Horse and an observer for the 23rd Squadron Royal Flying Corps and was shot down and died in a German hospital died of wounds, 9 Aug. 1916, at age 33 while a POW in a hospital in Ohrdruf, Thurungia, Germany. Buried: Niederzwehren Cemetery, Germany. Grave Location: IV.H.2. The insignias of both corps also appear in the bottom pane. Captain C.A. Larsen took the initiative in the spring of 1913 to put up a church in Grytviken, and during the year managed to complete the project with support from the newly elected pastor Kristen Løken, the employees in Grytviken, the floating whaling processing facility Nor whaling company Ocean and the Norwegian Seamans Mission. 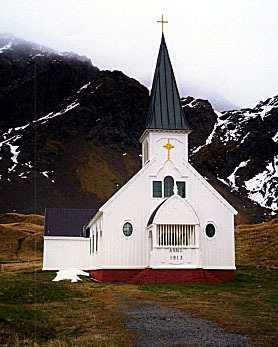 The church was designed by architect Adalbert Kielland and was pre-fabricated at Strømmen Traevarefabrik in Norway. In September the materials were brought down with the vessel Ocean from Larvik to South Georgia and it was built by the whalers themselves in 29 days. The two bells, cast at Olsen Nauen in Tønsberg, were first rung at Christmas Eve 1913 by Magnus Abrahamsen. St Andrews Old Church, site of Scott family graves. 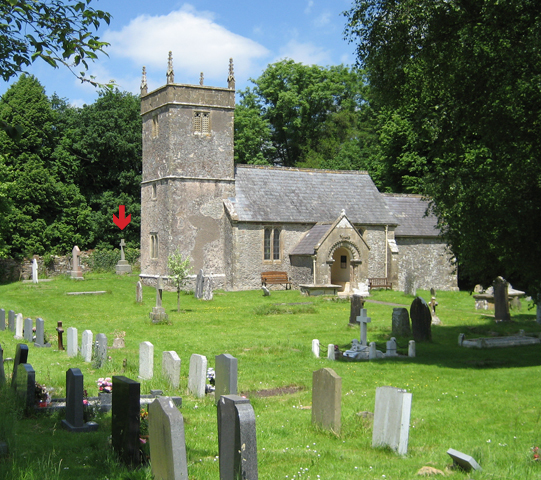 My visit of 5/30/99: This is a lovely church and churchyard that one approaches across a field. The church is tiny and used only a few times a year. The Scott gravesite is very close to a back corner of the church. It is a simple stone cross on top of a three stage base. On page 3 of the brochure at the church: "At the back of the church against the north wall in a dark and obscure place is the tomb of the Scott family, in which are buried the father, mother and brother of the Antarctic explorer. The tomb also records: And to the memory of Robert Falcon Scott C.V.O. Captain Royal Navy son of the above who in returning from the South Pole with his Companions was translated by a Glorious Death March 1912." From tape recording 5/30/99: [The beginning of this transcription was taped over. It picks up here] ...glorious death March 1912. [This is the last line of Scott's inscription; see below for full inscription] [also, see below for inscription on top stage] On bottom stage is a different colored stone and there is nothing on it. Going around clockwise on the next side it says on the top stage: "R.I.P. Also in most loving memory of Archibald O'Connor Scott, Lieutenant Royal Artillery son of the above who died of enteric fever at Hythe November 22nd 1898 aged 27 on returning from service in the Lagos [Lacos?] hinterland." On the bottom stage is "Hanna Scott, wife of the above John Edward and mother of Robert Falcon and Archibald O'Connor Scott who died at Hampton Court Palace March 22, 1924 in her eighty-fourth year." On the backside, top: "R.I.P. | In loving memory of Rose Campbell | daughter of John and Hannah Scott and | widow of Captain Eric Campbell Barcaldene | Royal Irish Fusiliers | Born 1864 - Died 1930" Middle stage: "Grace Myers Scott | (Monsie) | daughter of John Edward Scott | Died April 8, 1949"
Back on the first side, the one with RFS on it, on the sloping top of the middle stage is carved: "Also to the memory of" and below that is the inscription for Scott. This monument is probably about 12 feet from the side of the church. The setting is lovely. Ca. a mile or so outside the village of Holcombe. From photo and church brochure: "And to the memory of | Robert Falcon Scott C.V.O. 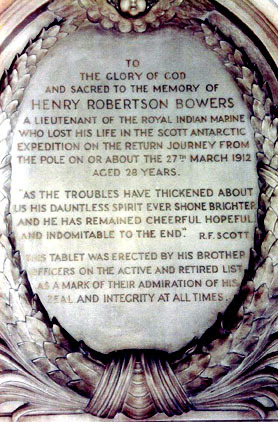 | Captain Royal Navy | son of the above | who in returning from the South Pole with | his Companions was translated by a | Glorious Death March 1912"
My visit of 6/10/08: All looks the same although the shrub behind the monument is gone and the inscription for Robert Scott is more difficult to read. Church in Inniskilling, site of a possible L.E.G. Oates memorial. It is said that there is a plaque to Oates in a church in this town. No further information. 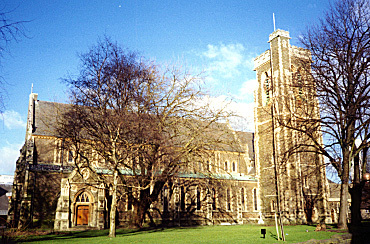 Christ Church, site of marriage of Ernest H. Shackleton. I could find nothing in the phone directory. 'London Encyclopedia' does list one that might be it: Christ Church, Down St, W1. "Built in the Decorated style in 1865 to the designs of F. and H. Francis. It was enlarged in 1868," (p.155). There's also listed Christ Church, Albany Street W1 but this is further north. 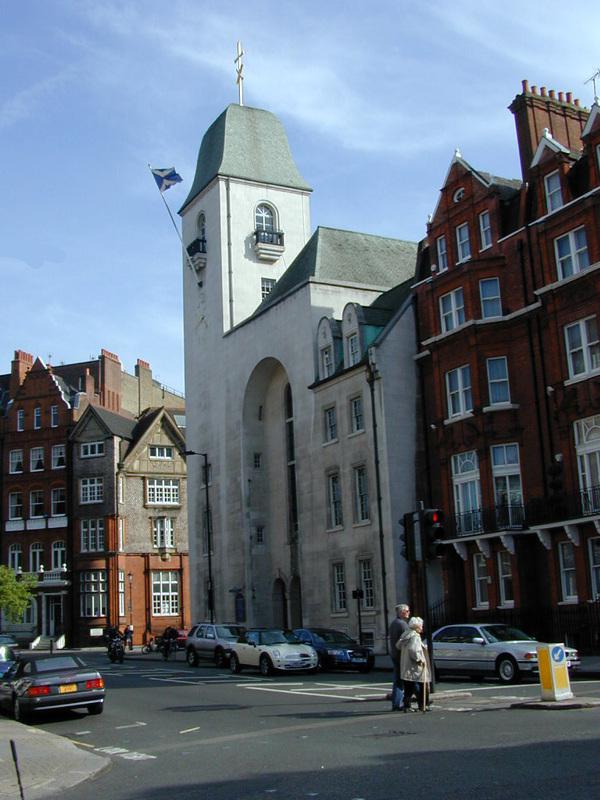 My visit of 27 September 2001: The Christ Church in Down Street is Christ Church Mayfair and now an Ethiopian Orthodox Church. I spoke soon after with Zaz Shackleton and she says the right Christ Church is (or was) the one on Victoria Street. Probably bombed during the war. There is a church on the northside of the street just west of Scotland Yard. 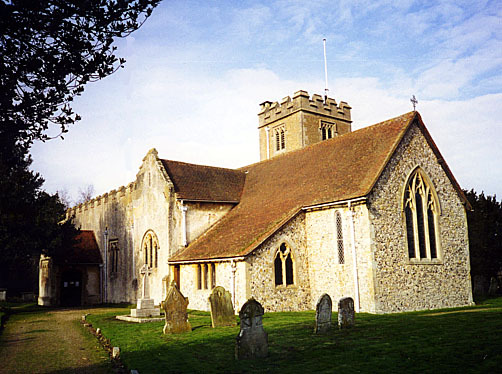 Church of St Mary Magdalene, site of marriage of Edward A. Wilson. Hilton, Huntingdonshire (now Cambridgeshire), UK. Location of the marriage of Edward A. Wilson and Oriana Souper, 16 July 1901. 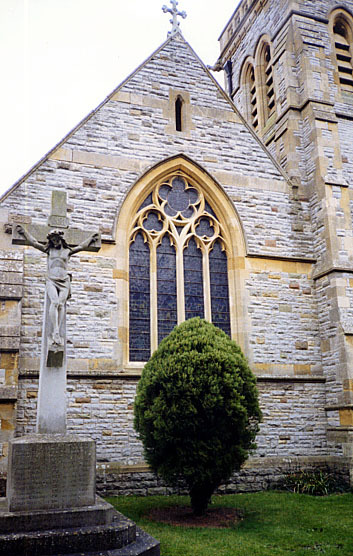 Parish Church of St Peter, site of inscribed cross in memory of Edward A. Wilson. Edwart T. Wilson M.B. Oxon. F.R.C.P. Parish Church of St Helen, site of Sir Clements Markham memorial. 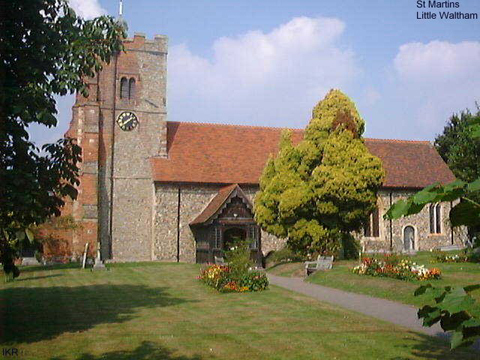 My visit of 10 May 2001: The church and churchyard are lovely. Stillingfleet is a small village about 7 miles south of York with two main streets, a pub, a shop I think, and a few houses. I met an Yvonne Clarke who happened to be at the nearby bus stop. She's a local historian and knew quite a bit about Markham. He was born next door in the vicarage (his father was vicar) which no longer stands. 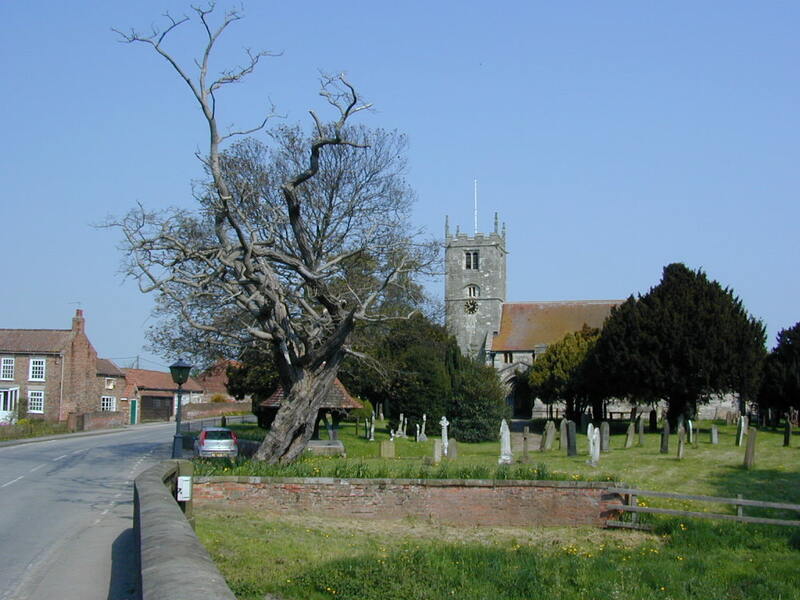 In the church yard next to the lychgate is a gnarly acacia tree that she believes Markham planted in 1877. The plaque is in the north wall of the church. St John the Evangelist churchyard, site of grave of J. Gordon Hayes. My visit of 13 May 2001: Pamela Hurle who lives in the old vicarage showed me where the grave is. It's flat and somewhat overgrown, quite close to the church. The grave inscription is on the stone surrounding it. Others (his father) are buried there. It reads: "also of the Rev. James Gordon Hayes M.A. Died Nov 23rd 1936. Aged 58 years"
The English Church, site in Montevideo of service for Shackleton. "With unerring instinct Lady Shackleton decided that the burial should take place in South Georgia, under the shadow of the mountains he had been the first to cross. On 15th February, after a ceremony in the English Church attended by the President and members of the Government, the diplomatic body and deputations from the British communities of Uruguay and the Argentine, Shackleton's remains were carried with all the pomp that Latin America could muster through streets lined with national troops to the British ship Woodville, bound for South Georgia." Holy Trinity Cathedral (Anglican) is at Reconquista 522, Montevideo. Its website says that the church is known locally as the "English Temple." Let's assume it's the right one. 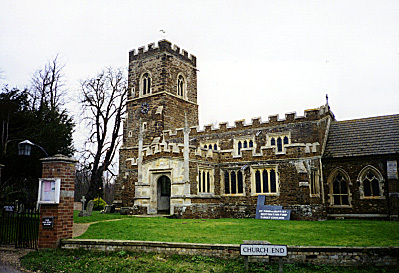 St Margaret's Church, site of marriage of Apsley Cherry-Garrard. Apsley Cherry-Garrard and Angela Turner were married here 6 September 1939. The funeral of Dr William Webster was probably held here as well. St Mary's Church, site of christening of Frank Bickerton. 123 Church Way, Iffley, Oxford, UK. 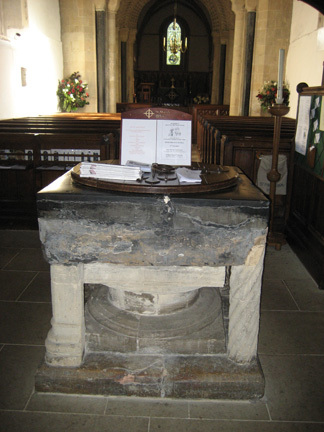 "St Mary's church, just down the road, is where he was christened [the font is pictured below]. Also a very fine church, well worth a visit on its own account." 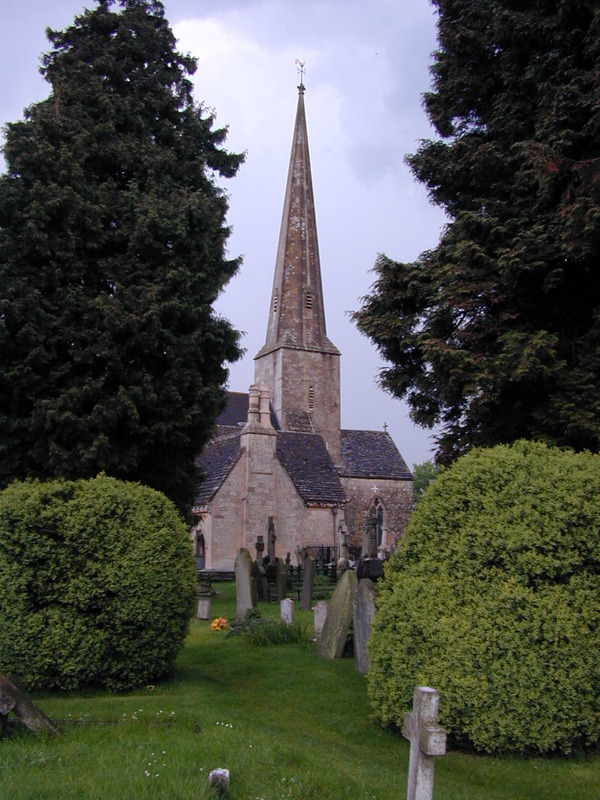 "St. Mary's Church, Iffley is an Anglican church serving the communities of Rose Hill, Donnington and Iffley. The Church can be found at the end of Church Way, Iffley. 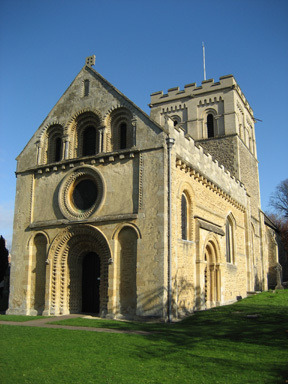 Iffley Church is famous for its beauty and architectural interest. It was built in 1170 and is one of the finest examples of Romanesque architecture in the country." Bickerton was born in a house a short walk away. This little hamlet only a mile or so from central Oxford is an absolute gem. You'd think you were deep in the country. Church of the Holy Rude churchyard, site of grave of Sir James Wordie. St John Street, Stirling, Scotland. Wordie died on 16th January 1962 at Grange Court, Pinehurst, Grange Road, Cambridge. 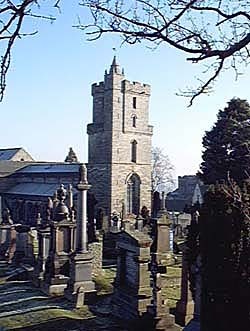 His ashes are interred in the Wordie family lair at the burial grounds of the Church of the Holy Rude, Stirling, Scotland. The Church of the Holy Rude—one of Scotl;and's finest medieival parish churches—is a long stone's throw from Stirling Castle. The picturesque graveyard is right next to the church. I spent several hours on two occasions searching for the grave (mentioned in Michael Smith's biography of Wordie) with no luck. A letter to Peter Wordie in Scotland brought the answer and the photo below. Photo sources: Left: http://www.instirling.com/sight/rude.htm. Right: Peter Wordie. Dunblane Cathedral, site of a Scott party memorial window.. The Cross, Dunblane, Perthshire FK15 0AQ, Scotland. 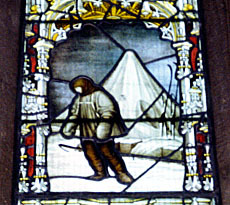 There is a memorial window for the Scott polar party in the choir, on the side closest to the road. It's a little tricky to find as it's partially obscured by woodwork. 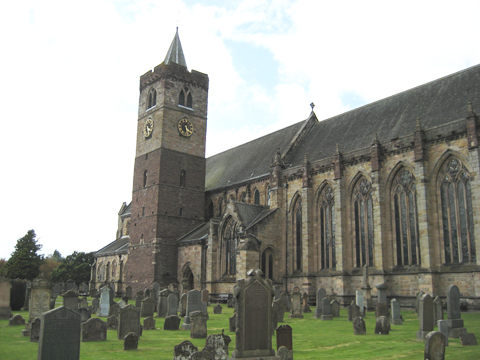 "Dunblane Cathedral, built upon a Christian site first established by Saint Blane around the year 600, is one of the few surviving medieval churches in Scotland. . .
Then comes the Chaos Window, showing fire, storms, cold and snow--at the bottom of which the five members of Scott's ill-fated expedition to the South Pole in 1912 are named." St Columba's Church, site of marriage of Sir James Wordie. Pont Street, London SW3, UK. "When the pair (Wordie and Gertrude Mary Henderson) were married on 21 March 1923 at St Columba's Church in Pont Street, London..."
Source: Michael Smith, Sir James Wordie Polar Crusader, p. 161. 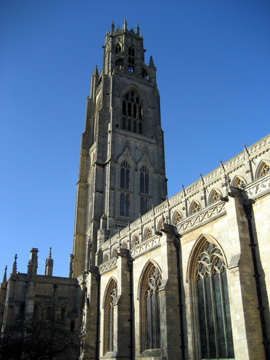 St Botolph's Church, site of memorial to Joseph Gilbert and Robert Rollett of Cook's Second Voyage. The plaque is on north wall under the tower. It is dedicated to several people on Cook's voyages. Two, Joseph Gilbert and Robert Rollett, were on the Second Voyage. That portion reads: "Joseph Gilbert Astonomer of Wrangle and Robert Rollett of this town who served on Cook's second expedition." The tablet was unveiled by the Acting High Commissioner for Australia on December 13, 1945. Holy Trinity Church, site of memorial to Francis Croizer. Church Square, Corner Church & Dromore Streets, Banbridge, County Down, Northern Ireland. 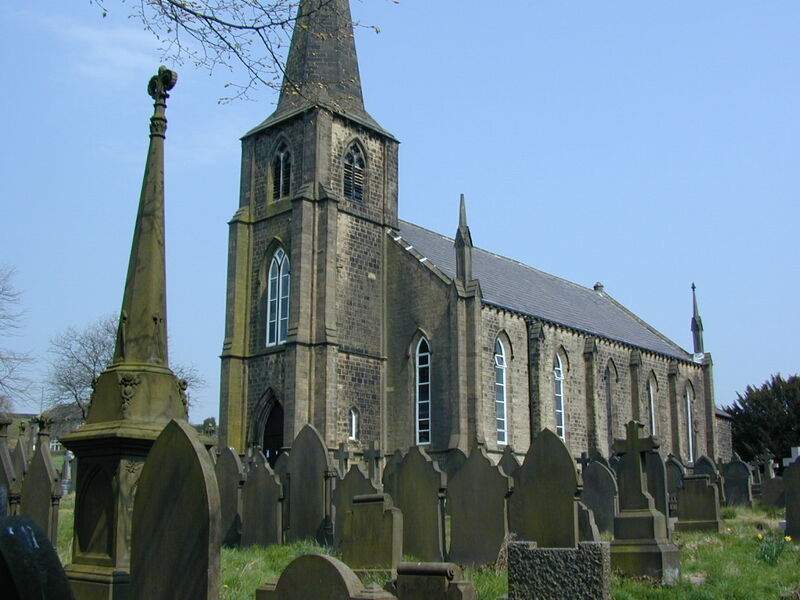 "One of the parishioners who attended services both in the old Church, where his brother Graham Phillip was curate in 1828, and in the new Church, was Captain Francis Rawdon Moira Crozier R.N., F.R.S., F.R.A.S. He was the fifth son of George Crozier Esq., Attorney-at-law, Church Square, Banbridge and was born there in September 1796. After distinguished service on many voyages of exploration, he sailed on the 19th May, 1845, as Captain of H.M.S. Terror and second-in-command to Sir John Franklin, on an Expedition to the Arctic. 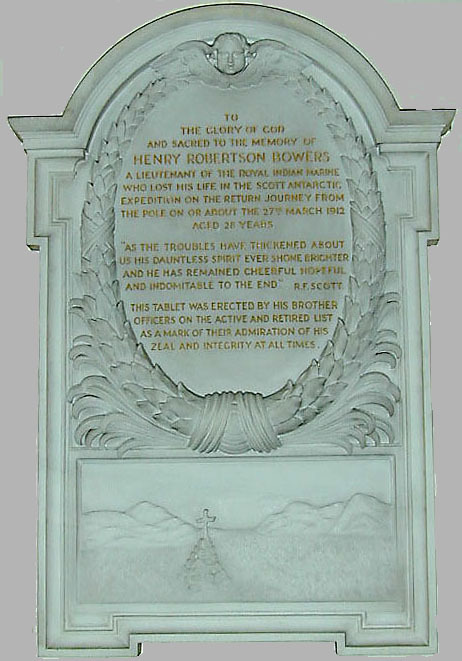 The purpose was to complete the search for a North-West Passage, a navigable water link that would allow passage from the Atlantic to the Pacific Ocean through the Arctic. . . .
A mural tablet depicting the ship wrecked among icebergs was given to the Parish Church in 1856, by Captain Crozier's surviving brothers and sisters. The tablet is the work of the eminent sculptor J. R. Kirk R.H.A. as is the statue of the monument. There is also a memorial plaque on Captain Crozier's birthplace in Church Square." "The two small panel carvings in the niches, with the larger Crozier Memorial (also by J.R. Kirk) in Seapatrick Church, are of considerable merit. All display Erebus and Terror (the ships of the expedition) starkly embedded in great chunky three-dimensional ice-floes, exciting and near-abstratct triumphs of the imagination, as weird and poetic as the rockery mountains invented by Joachim Patinir and for the same reason: neither artist had ever seen what he sought with such intensity to portray." Source: Fax from Banbridge Tourist Office. 5TH SON OF THE LATE GEORGE CROZIER ESQR. IN SEVERAL EXPLORING VOYAGES UNDER SIR E. PARRY AND WITH SIR J.C. ROSS IN THE ARCTIC AND ANTARCTIC REGIONS. IN THE EXPEDITION FOR THE DISCOVERY OF THE N. WEST PASSAGE. FROM THIS HEROIC SERVICE NEITHER HE NOR ANY OF HIS BRAVE COMPANIONS EVER RETURNED. TRUEST SONSOLATION TO HIS SORROWING FRIENDS. Church of St Peter and St Paul, site of memorial to George Vince. To the memory of GEORGE VINCE A.B. R.N. Of the Exploring Ship, Discovery. under Capt. Robert F. Scott, R.N. Born at Blandford Sept. 20, 1880.
at Ross Island March 11, 1902. The only one of the Ship's Company who lost his life. St Martin's Church, site of stained glass memorial window for Edward Joseph Bird. The window is at the chancel on the south wall under the tower. It is dedicated "To . the Glory . of . God . and . in memory of | Admiral . Edward . Joseph . Bird | born . August . 15th . 1799 . died | November 3rd . 1881', 'S: Martin', 'S; Alban'"
It was the work of Alfred I. Hemming and was erected in 1884. Bird was Lieutenant aboard Erebus on Ross's expedition to the Antarctic and the Captain of the Investigator in search of Sir John Franklin. Mt Bird on Ross Island is named for him. 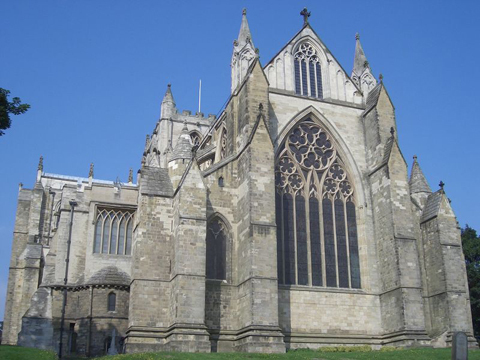 Ripon Cathedral, site of memorial to John Elliott. To the Memory of the late John Elliott Esqr. of Elliott House, near Ripon, Commander, R.N. Lord Rodney's glorious action, on the 12th April, 1782; in which he was severely wounded. uprightness, in all the relations of life. He was born Jany 11th 1759 and died Sept. 17th 1834.
and died July 9th 1841; generally respected for her amiability and domestic virtues. Likewise to the memory of the following children of the above. Charles Frederick Elliott, born May 17th 1790; and died January 4th 1791. Gilbert Elliott, born February 13th 1795; and died May 17th 1795. Maria Elliott, born November 14th 1797; and died September 3rd 1800. Charles Bowes Elliott, born July 25th 1791; and died at Durham, November 2nd 1801. Charlotte Eleanor Elliott, born October 4th 1803; and died April 17th 1812. Frederick Edmund Elliott, born November 1st 1808; and died June 18th 1821.
the county of Lancaster, born Oct 18th 1802; and died deeply lamented, Novr 18th 1844. Sibbella born June 28th 1789: died May 17th 1850. Source: Ian Boreham, Cook's Log, vol 30, no 2 (2007), page 32. Photo sources: Left, Wikipedia. Right, Ian Boreham, from Cook's Log, vol 30, no 2, 2007. Parish Church of St Anne, site of memorial to Henry Foster. A wall monument of marble depicting a mourning seaman leaning on a pillar inscribed 'FOSTER' and flanked by an anchor, flag and navigational instruments. INSTANTLY PROMOTED HIM TO THE RANK OF COMMANDER. AND IN A MOMENT WAS LOST TO HIS COUNTRY AND HIS FRIENDS. ON THE 8TH FEBRUARY, 1831, AND IN THE 34TH YEAR OF HIS AGE. AND OF THE DEEP REGRET THEY FELT FOR HIS UNTIMELY DEATH. HE WAS THE SON OF THE REV: HENRY FOSTER, INCUMBENT OF THIS CHAPELRY. Sources: http://www.nmm.ac.uk/memorials/Memorial.cfm?Topic=21&MemorialPage=8&MemorialID=M4887. Also, Savours, Ann and Anita McConnell, Journal Kept by Midshipman Joseph Henry Kay during the Voyage of HMS Chanticleer, 1828-1831, Part 3 of Four Travel Journals. . . (London: The Hakluyt Society, 2007.) Series III, Volume 18. A photo and transcription of the memorial appear on pages 266-67. There is some variation between the two sources.